You could probably consider this a Summer 2014 issue of Artwork Adventures, as shows that ended this past week feature pretty heavily. Fanart is an interesting thing because it represents a level of fandom engagement different than what we often experience on blogs, Twitter, Reddit, or on anime forums. It’s always fascinating to me that there’s basically another entirely different segment of the fandom (a ridiculously talented segment) that spends their time creating artwork of the shows they love, rather than just yakking away about it. Anyways, on to the pictures! This is a tribute to happier days. RIP, Hime-sama—I liked you best. 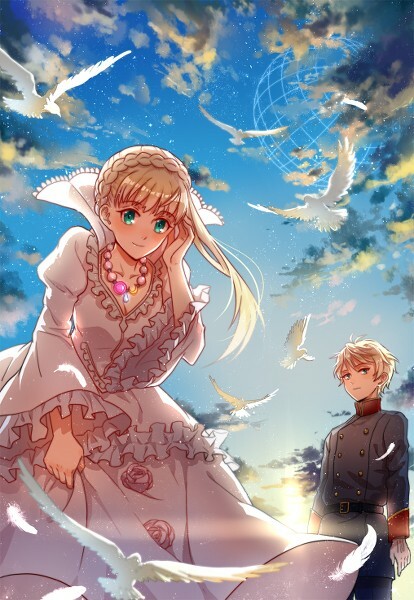 There’s a metric ton of Aldnoah.Zero Slaine x Hime x Inaho fanart out there on Pixiv, but I liked that the designs in this one were a little bit less moe than most. I’m also a big fan of the hologram-looking planet up in the sky. 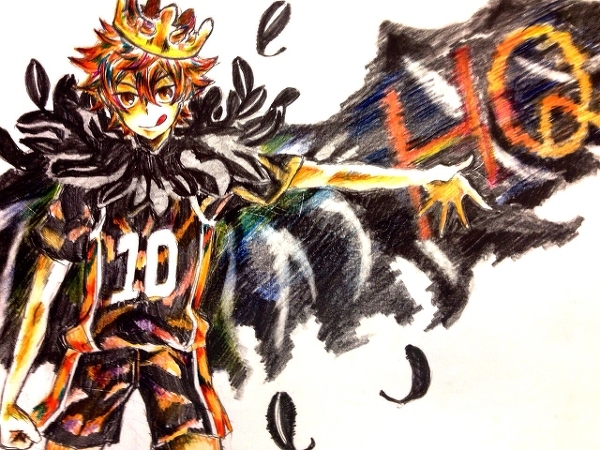 Farewell, Haikyuu!! I’m going to do my best to not limit myself entirely to slick computer artwork (because that’s what most often catches my eye). This looks like colored pencil to me, and I like how all the lines in the cap give the illusion that Hinata has just thrown in out. Couple that with his dorky tongue face and you’ve got a winner. I was actually really delighted with the way Nozaki-kun ended. Despite the fact that Nozaki didn’t grab Sakura and give her a big ole kiss, I felt like their final scene together was a really nice way to end the series. And yeah, I think Sakura does have a chance at someday getting Nozaki to notice her feelings. 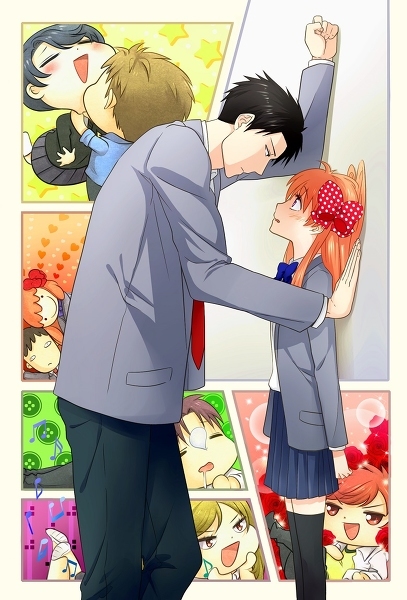 As for the picture itself, I mostly picked it for the funny chibi depictions of the cast in the background….okay, and a little bit for Nozaki and Sakura looking heartstoppingly like they’re about to kiss. 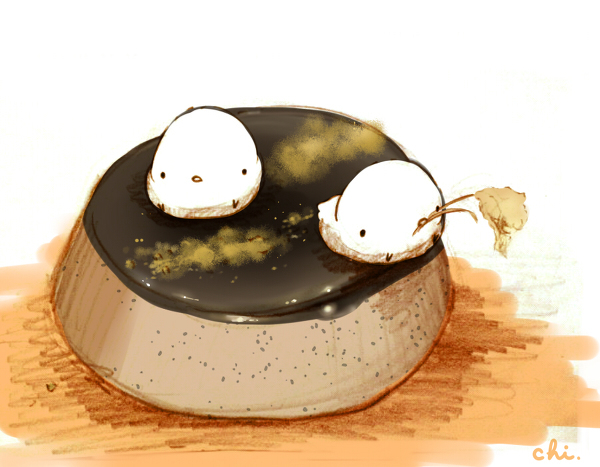 I found this picture at the top of Pixiv’s Mysterious Library spotlight, and man, does it deserve to be there. It’s an original, and the obvious feature is the beautiful glowing blue globe. I also like how the lighting moves from warmer and brighter on the right to cooler and darker on the left. It makes the globe stand out just that much more, and also allows for the cool effect of the lamp on the left side of the picture to make its own little spot of light in front of the plant. KyoAni’s Free! Eternal Summer was another of the shows that ended this week. 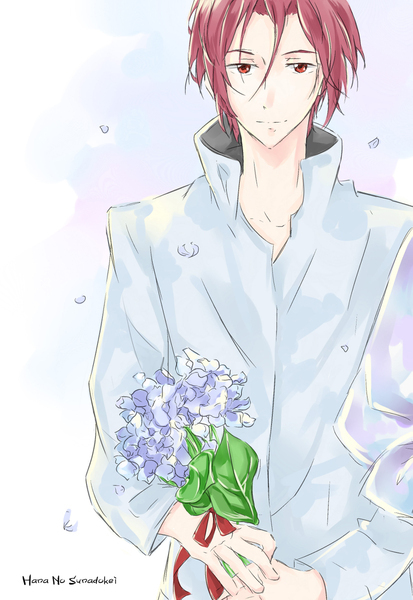 You guys should know by now that I really like red hair, and while Rin’s sister, Gou, is wonderful enough that I wrote two episodic posts just about her, I can’t deny that Rin looks quite fetching in this picture. I love his blue tinted shirt and the way the ribbons on the flowers he’s holding compliment his hair. 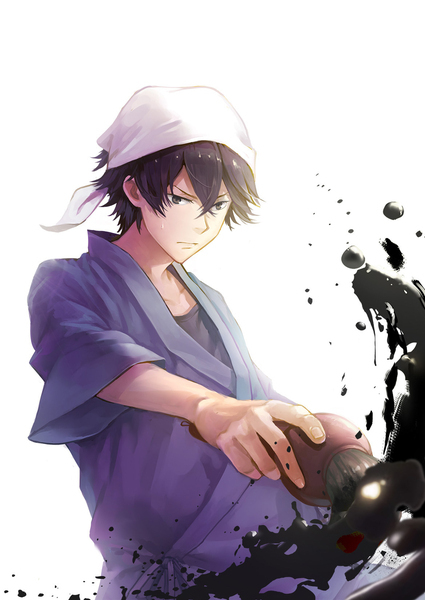 This is Barakamon‘s first appearance on my blog in any form, and how appropriate that it would be through artwork that it makes its debut. I’m loving the show so far (about halfway through), and depending on how it wraps things up it could beat out Nozaki-kun as my favorite of the season. But anyways, the picture. As is probably evident by now, I hugely admire pictures that imitate motion effectively, and this is just another example of it happening, with the brush in midstroke but the ink moving past it already. 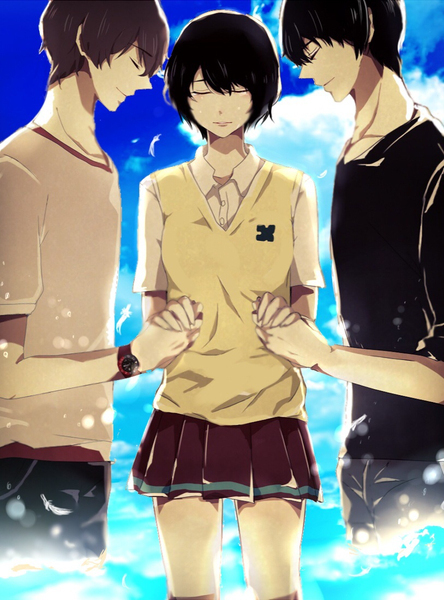 It should come as no surprise to anyone who’s been reading my Zankyou no Terror posts that a picture like this would be the one I would pick for this week, the week of the show’s finale. Not only is this picture something of a reflection of what was important to me in the show, but it also is beautifully rendered. I love the way the blues progress from a brighter hue at the bottom to a deeper, richer hue at the top of the image. Lisa’s hands are on top of the boys’ hands, almost in a comforting gesture. The whole set up reminds me very much of a prayer, perhaps for a peaceful rest for these two boys who have done so many difficult things. And that’s all for today! Let me know how you’re liking these posts in the comments below! I like these posts! I’ll keep reading them if you keep writing them! That original picture is stunning. 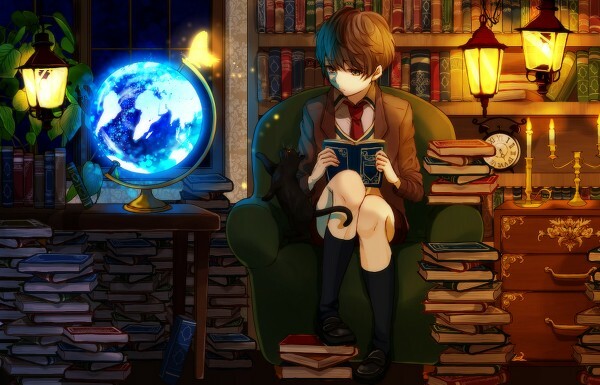 I’m a sucker for images with libraries and books, I think they always have a lovely aesthetic. Ooo that’s a nice one! I’ll see if I can find you a good one from Gosick for next week! If you ever need help with certain artwork bless, I don’t mind helping. I mean if it wasn’t obvious from CR, I practically live inside of Pixiv. Heh well exploring would be how I would find anything. I’m not a member on Pixiv, just use my G+ account. So I can’t sort by popularity, everything I have found is just by random finds. Some advice that may or may not be needed: Popularity rankings on the right side of the homepage is a good start, looking through suggested users (and maybe following them) from the left side can come up with some amazing pieces (this is where I would say 80% of the art I have shared on CR has been from), and finally patience is a virtue on Pixiv especially when looking through say… the New Work: Everyone section, because you can be looking through a lot of… interesting (and not in a good way) pieces for awhile doing that. Oh, I actually do have a Pixiv account (is that the same a G+?)! I don’t have a premium one, though. I think a regular Pixiv account and G+ (or Facebook) are the same. But premium accounts cant sort searches by popularity, which helps when looking up specifics, like if you search Nisekoi, you are met with probably a few dozen pages of art work at least, so searching by popularity would put the good/amazing pieces up front, probably.